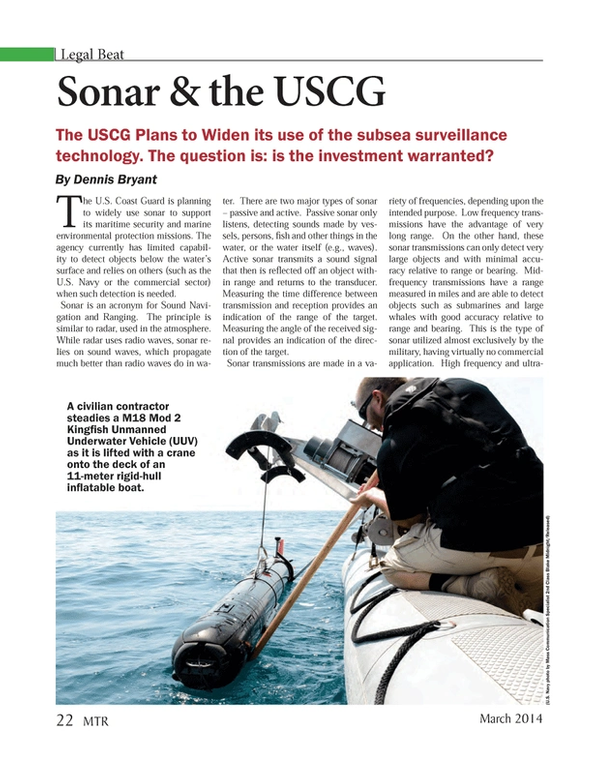 The USCG Plans to Widen its use of the subsea surveillance technology. The question is: is the investment warranted? The U.S. Coast Guard is planning to widely use sonar to support its maritime security and marine environmental protection missions. The agency currently has limited capability to detect objects below the water’s surface and relies on others (such as the U.S. Navy or the commercial sector) when such detection is needed. Sonar is an acronym for Sound Navigation and Ranging. The principle is similar to radar, used in the atmosphere. While radar uses radio waves, sonar relies on sound waves, which propagate much better than radio waves do in water. There are two major types of sonar – passive and active. Passive sonar only listens, detecting sounds made by vessels, persons, fish and other things in the water, or the water itself (e.g., waves). Active sonar transmits a sound signal that then is reflected off an object within range and returns to the transducer. Measuring the time difference between transmission and reception provides an indication of the range of the target. Measuring the angle of the received signal provides an indication of the direction of the target. Sonar transmissions are made in a variety of frequencies, depending upon the intended purpose. Low frequency transmissions have the advantage of very long range. On the other hand, these sonar transmissions can only detect very large objects and with minimal accuracy relative to range or bearing. Mid-frequency transmissions have a range measured in miles and are able to detect objects such as submarines and large whales with good accuracy relative to range and bearing. This is the type of sonar utilized almost exclusively by the military, having virtually no commercial application. High frequency and ultra-high frequency sonar transmissions have a short range, but are able to detect small objects. This type of sonar is utilized commercially and is the type under consideration by the Coast Guard. Sonar in the form of echo-sounders has been utilized for years by ships to determine the depth of water under the keel. A signal is transmitted straight down. The signal reflects back when it hits the seabed. The time difference provides the operator with an accurate measure of the depth. More sensitive versions are in use as fish finders. These devices differentiate between the strong signal generated by reflections off the seabed and weaker signals generated by reflections off objects in the water column. Sophisticated versions provide more detailed information, allowing determination of the size of the fish school, etc. Sonar transmitters can even be attached to trawl nets, allowing for better placement of the nets relative to the target species. Stronger and more sophisticated sonar can be used to penetrate the upper layer of the seafloor, allowing determination of characteristics such as bottom type (i.e., mud, sand, gravel) and depth to hard strata. This information can prove valuable for determination of anchorage grounds and for laying of submarine cables and pipelines. Sonar is used commercially to examine hulls, pilings and underwater structures such as offshore platforms. This type of sonar is sometimes handheld by a diver or mounted on the end of a pole. Increasingly, it is mounted on remotely operated vehicles (ROVs) or on unmanned underwater vehicles (UUVs). ROVs have greater capabilities regarding power and data transmission, since they are tethered to a shore location or to a manned vessel. UUVs have less power and data transmission capabilities, but can get into tighter spaces and have longer potential range. Diver detection sonar is used for detection of divers and submerged swimmer delivery systems, such as those used in several of the James Bond movies. This sonar provides detection, classification and tracking information on human underwater incursions that could endanger lives or property. It is being employed around some marine facilities worldwide, but not yet to a great extent. Limpet mine imaging sonar is used for detection of small underwater objects. Originally used for detection of limpet mines potentially attached to the hulls of ships, it can now be used to detect caches of drugs and other contraband. This type of sonar may also be used to detect hull damage and underwater structural damage. The Coast Guard proposes to utilize commercially-available sonar equipment to broaden its capability to locate, image and classify submerged and underwater targets of interest (TOIs). This would include such things as terrorist attacks and environmental threats (i.e., pipeline leaks). This usage is aimed at protecting human safety, preventing property damage, and protecting the marine environment. Use of the sonar by the Coast Guard is envisioned as of short duration and within a limited geographic area. For example, it might be used to protect a high-level dignitary during a visit to a waterfront facility. Alternatively, it could be used to examine an offshore facility from which oil is emanating to determine the location and extent of damage or other cause of the discharge so that it can be promptly remedied. At least for now, the Coast Guard intends to utilize commercially-available sonar with frequencies above 50 kHz. As a result the capabilities, limitations and potential adverse effects of equipment are reasonably well-known. This, combined with the short duration and limited geographic scope of the sonar use, will serve to minimize any environmental impact. Further, the Coast Guard proposes to consult with other agencies, such as the Fish and Wildlife Service (FWS) and the National Marine Fisheries Service (NMFS) prior to each planned use in all but emergency situations to determine whether there are particular environmental concerns that should be considered, such as endangered species in the vicinity. The Coast Guard also plans to utilize observers to monitor usage and identify any unexpected risks, such as boaters or swimmers approaching the area. The sonar systems under consideration by the Coast Guard operate within the hearing range of toothed whales (150-180 kHz) and pinnipeds (75 Hz – 75 kHz). Some clupeid fish (i.e., herring, shad, sardine, menhaden) may also react to these sonar transmissions. Minor adverse impacts could also occur in the unlikely situation if a ROV or UUV were to touch down on seagrass, coral or sediment. The use of low-power HF and UHF sonar (as opposed to high-power MF military sonar) minimizes adverse environmental impact by reducing the area ensonified by the equipment. The purpose of the Coast Guard proposal is to broaden the agency’s capability to locate and classify underwater threats and other targets of interest and to more safely and effectively accomplish the Coast Guard missions. Targets of interest could include combat swimmers or divers; explosives or other offensive devices that could be delivered to underwater hulls, piers or other shore structures; and objects that have become submerged as a result of natural or man-made disaster and have the potential to interrupt maritime transportation, trade, commerce, recreational boating or other maritime activities. The use of HF (50-999 kHz) and UHF (1,000 kHz and higher) active sonar technology would provide operational commanders with enhanced ability to support maritime security, marine safety, and maritime stewardship with minimal impact on the environment. The likelihood of a terrorist attack by divers in U.S. waters is extremely low. More likely are suspicious incidents that require prompt investigation and response, similar to the various private pilots that negligently stray into restricted airspace around the White House. It is expected that the Coast Guard will more frequently use sonar to investigate suspected contraband stashes affixed to the underwater hull of incoming vessels, marine casualties, hazards to navigation, and environmental threats. Used properly, sonar can provide the Coast Guard with important new capabilities.